If the thought of making multiple trips to the dentist for uncomfortable, invasive procedures to fix a problem tooth sounds like a horrible proposition, then we have just the solution for you. At your Portales dentist, Peter Thompson, DDS we use the latest technology to make fixing teeth as fast and pain-free as possible with CEREC® same day technology. With CEREC, a process that used to require messy impressions, temporaries, and several weeks between several appointments can now be completed from start to finish in a single visit. Dr. Thompson uses our advanced CEREC same day milling machine to create a ceramic inlay or onlay, which fits perfectly to your existing tooth, in only one office visit! When you come in for your dental work, Dr. Thompson will use a small camera to create 3D digital images, or optical impressions, of the tooth that needs repair. This eliminates the need for a physical mold, which is unpleasant and time-consuming, with much chance for human error. Using advanced digital software, Dr. Thompson is able to create a precision inlay or onlay to repair your tooth. The software sends the exact dimensions to an onsite milling machine, with advanced diamond coated instruments. In as little as 15 minutes we can create your new, permanent restoration to bring your tooth back to health. The finished piece is adhered to your existing tooth using a bonding material and hardening light – permanently attaching the inlay or onlay to your tooth. Light polishing or glazing of the restoration make it look, feel and function just like your natural tooth. If you think that beautiful crowns are only for members of the royal family, think again! At your Portales dentist office of Dr. Peter Thompson, we can create beautiful, natural-looking, and durable dental crowns to repair teeth that have been damaged by trauma or decay. And the best part is, we can complete the whole process, from digital impressions to the final restoration, in a single visit! 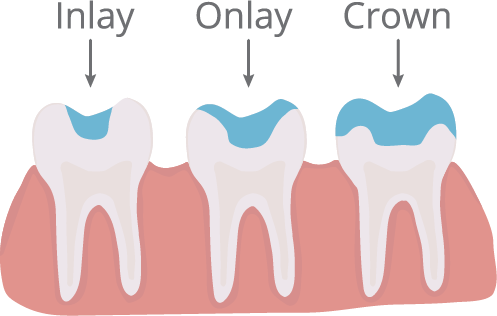 Dental crowns are used as opposed to a filling, inlay or onlay when the decay or damage to a tooth is too extensive to be partially filled and remain viable on its own. Dental crowns cover the entire remaining tooth after damage and decay have been removed, to prevent further damage from occurring and to strengthen the tooth. If you are missing a tooth or multiple teeth, you understand the frustration and embarrassment that comes along with it. Missing teeth can have an impact on all areas of your life, making it hard to speak normally, enjoy your favorite foods, and smile with confidence. 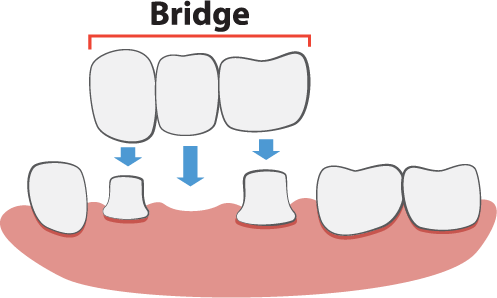 Dental bridges can help revive your natural smile and correct shifting that has occurred in teeth surrounding a missing tooth. Sometimes called a partial denture, Dr. Thompson creates dental bridges from tooth colored porcelain and attaches them to the teeth adjoining a gap. Created in the shape of a natural tooth, the dental bridge acts as a permanent filler that can make your smile more youthful, radiant, and healthy. An unfortunate fact of life is that our teeth age just like we do. Thankfully, with advances in modern dentistry, we can replace them with beautiful, secure, and natural looking dentures that mimic your natural teeth in form and function. Suffering the loss of your natural teeth can be difficult, but Dr. Thompson can provide a fantastic solution for you. 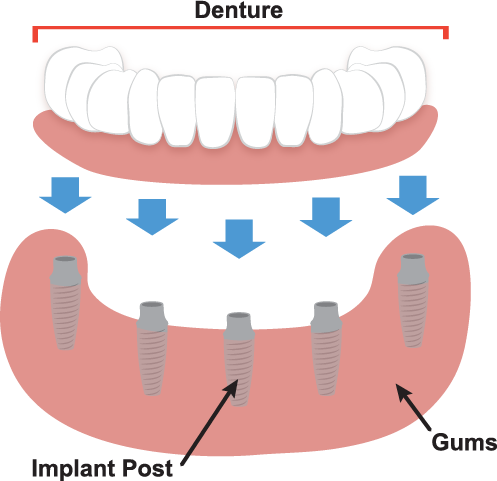 Dentures and partials are dental prosthetics, either removable or fixed, that replace missing teeth, working either by themselves or through attachments to dental implants. We will begin the process with a consultation to determine the best course for you, taking many factors into account, including your oral health and bone quantity and quality. Restoration is critical for maintaining the health of your surrounding teeth, improving chewing and digestion, and restoring confidence. Dentures from your Portales dentist can help you achieve the smile you’ve always wanted, without ever having to worry about whether they will stay in place or look natural. Your dentures will look, feel, and function just like your natural teeth! If you are experiencing chronic dental problems, it could be time to see Dr. Thompson! Most people living with deteriorated and/or missing teeth know that they need major dental work. But, what they likely don’t realize is that their dental problems may be the real root of other issues including frequent headaches, shoulder, and neck pain, popping or aching jaws, and many other problems. Partial or full mouth rehabilitation could be the answer. When teeth are lost, decayed, or ground down over the years, the jaw no longer falls into its natural and relaxed resting position. This causes the muscles that control the jaw to be in constant tension, which causes any number of issues, and causes a person to be in near constant discomfort. Restoring the bite to a proper position can, in some cases, provide immediate relief. A critical part of this procedure is knowing how much tooth to restore and which procedures need to be performed. Dr. Thompson will examine your teeth, gums, temporomandibular (jaw) joints and muscles, as well as your smile’s aesthetics, to determine how best to proceed. This could include x-rays, digital images and/or models of your teeth to determine the bite. Then, together, we will come up with a personalized treatment plan to get your oral health back on track so you can live your best life. If you have any questions about restorative dentistry or would like to schedule a visit with your Portales restorative dentist, Dr. Peter Thompson, give us a call today or request an appointment online!